You are here: Home › IIAR › AOTY › IIAR Analyst Of The Year › IT Analysis Firms › Gartner › IDC › MWD › Redmonk › The IIAR Analyst of the Year survey — and the winner is…. Over the past few months, the IIAR have been running a survey to identify who AR practitioners believe should win the award of ‘analyst of the year’. With over 116 respondents from around the world, the number of firms and individuals that people wanted to recognise was extraordinary (191 different analyst names and 103 separate houses). Ray Wang, Principal Analyst with Forrester Research, Inc., is the analyst of the year. Respondents praised his insight, depth of industry knowledge, and independent voice. Runners up for the title were David Mitchell of Ovum and James Governor of RedMonk. Ray was also named Analyst of the Year for the Americas, while David Mitchell of Ovum was voted the EMEA Analyst of the Year. Forrester was highly regarded by respondents in all regions, and was voted the Analyst Firm of the Year. It was commended for the strength of its analyst team, the quality of its client services and its ability to spot new trends. Gartner and IDC came second and third, respectively. Not only have the traditional global analyst firms done well in this year’s survey, but the smaller, boutique consultancies also scored highly. Freeform Dynamics and MWD came in the top five in EMEA with RedMonk in the top three in the Americas, and a number of other firms also received honourable mentions. Respondents liked their honesty, ability to innovate, the quality of their research and use of new media channels. What came out clearly from the survey was that integrity, independence and market knowledge are the analyst qualities that are most highly valued by AR professionals. It demonstrates very positively how much the IT research industry has matured. The results below have been split into several segments to reward those whose specialty in niche areas should be recognised. I’m very pleased to receive this distinction. AR professionals represent the critical link between an analyst’s perception and the company’s reality. Because the AR profession is not only a science but also an art, good AR professionals build the relationships from a position of trust which drive the foundation for all interactions. I’m thankful to have worked with so many true professionals. Analyst relations professionals are playing an increasingly important and influential role in the ICT (Information Communication Technology) industry, both when working directly for companies and when working as third party advisors to those customers. As such, it’s a great honour to be recognised by the IIAR. One of the interesting results from the survey is the distinction made between relevant and important analyst firms. From my perspective it appears that people made the recognised tier 1’s (Gartner, Forrester, IDC) as the most important as they realise that these companies have a strong impact on sales due to their customer base and research viability. However, relevant firms did not necessarily map on to these same firms and the ones ranked most highly tended to have a greater focus on bespoke advice (largely gained through inquiry time). When we run this survey next year we would be delighted to hear suggestions regarding how this can be improved. For your benefit I have listed below a brief summary of the methodology used. The survey specifically focused on an individual’s perception of the analyst world in 2007. All questions were free text to ensure that results could not be biased by presenting a pre-made list of companies or analysts. The result of this was extraordinary with 191 different analyst names being submitted as ‘analyst of the year’ and 103 different firms listed for the ‘analyst house of the year’. Respondents were asked to specify their submissions based upon geography (US, EMEA, AsiaPac, Global) and segment (Software, Hardware, Services, Communications and Networking). Based upon these criteria further analysis could be made of the results to identify specific regional or segment champions. 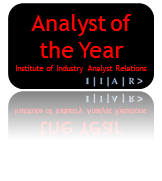 31 Responses to The IIAR Analyst of the Year survey — and the winner is…. Just a quick note to say congratulations to all that have been recognised. It is particularly pleasing to see the work of smaller as well as larger firms being acknowledged. Some will know that I was a little concerned about the vendor centricity of this survey, but my fears have been allayed by the phrase “integrity, independence and market knowledge are the analyst qualities that are most highly valued”, which is perhaps the most important and encouraging finding to arise from this research, and hopefully defines the spirit of this industry moving forwards. In the meantime, I would like to take the opportunity on behalf of the Freeform team to thank all of our colleagues in AR, not just for their support of what we have been doing over the past couple of years, but also for all their hard work in making our jobs easier and more pleasant to carry out. Congrats to you. I am delighted that the work of boutique firms has been recognised (and rewarded) through this survey. I was fully aware that one of the golden rules of AR is not presenting competitive research data to other analyst houses as they tend to pick holes in the methodology. Hence, i am pleased that your concerns about vendor centricity have not been realised. I would welcome your guidance on how we can improve this survey next year. As a final comment – thanks to you (and all the analysts) for your support too. Well you can knock me over with a feather! I’m sure that if you re-check the results you’ll see that having my name on here is a typo. But that said, I’ll enjoy being in such distinguished company until you rectify the mistake that’s obviously been made. As James of RedMonk said… coffee sure tasted good this morning, as did the G&T this evening. Was really good for a UK-based analyst like me to be recognized at home in EMEA and in the US market. Makes the air miles put in during the year seem worthwhile…. though still pretty tiring. Better still to see Ovum as a whole recognized. Thanks from me and rest of the Ovum team. Lovely piece of work. I have no doubt that this will become a benchmark in much the same way that league tables are. Congrats to all the winners… and thanks for publishing such a comprehensive review of the analyst community that not only recognizes the good work of those listed but raises the bar for everyone.